Here we have an impressive production headed by Cameron Lee of Lancashire. The 21 year old wrote the script and will direct once it moves into filming – you can find out more, and back the project, at The Future Stone. It’ll star music legend Damo Suzuki of experimental ’70s band Can. Here’s a snippet of the plot: A middle aged man from the North West of England is diagnosed with cancer. He had been leading a comfortable life, but the news takes him out of his comfort zone and sets him on a deeply personal journey to make something of the diagnosis. It appears he has a borderline shamanic desire in pursuing this goal. But when confronted with a persuasively destructive individual, he battles inner demons to overcome deadly obstacles and discover the real purpose of his visit. Iranian director Abbas Kiarostami is a major influence, who’s perhaps most famous for his Koker Trilogy and A Taste of Cherry, which won the Palme d’Or at Cannes in 1997. Acclaimed American critic Roger Ebert famously handed it 1/4, although it’s clear he’s in the minority with such an assessment. As with Kiarostami’s film, The Future Stone dares to challenge a topic many directors steer well clear of – suicide. It features a strong anti-suicide message, which is delivered at a time when mental health is finally receiving the widespread attention it requires in the business, media, and political worlds. To accomplish this, he’s clearly had a thorough approach to the aesthetics the film will be presenting. With shooting locations such as the Jura and Islay in Scotland, plus Rivington and Horwich in Lancashire, it’ll unquestionably have dramatic, sprawling landscapes on its side. This will be complemented by a particular use of atmosphere, colour, and mood that drifts towards a theme of existentialism. Lee has already produced two films, We Are All Together and Yours to Keep. There’s a young production crew of 10 people supporting The Future Stone, whose lead actor not only makes it up to number 11, but will turn heads in the alternative music scene. The Future Stone’s lead will be something of a surprise for those alternative music fans. Damo Suzuki has been a musician all his life, but (to my knowledge, plus after some thorough research) has been a part of several documentaries, but has never acted. For many, he’s best known for his work with the groundbreaking Krautrock band Can, who emerged in the late 1960s. Its founding members were determined to shake up Germany’s cultural scene in the aftermath of WWII. After the band’s first singer, Malcolm Mooney, left dramatically (Can’s music was so hypnotic it triggered off mental health issues for him during a live performance) a replacement was needed – Suzuki was spotted busking in Munich and hired on the spot. Three legendary albums emerged from this – each one a landmark achievement: Tago Mago (1972), Ege Bamyasi (1973), and Future Days (1973). These are highly recommended for any alternative music fans, particularly if you like indie, rock, jazz, funk, and endlessly remarkable drumming patterns. Suzuki left Can in 1973 and dropped away from music, returning in 1983 as a solo artist. Now, as part of the Damo Suzuki Network, he travels the world to perform in one offs with various musicians. He’s taking a break from all that to star in the film, which offers him the chance to challenge the nature of his illness on screen. The Future Stone first has to enter production. An independent project, Lee has setup an IndieGoGo page to help fund everything required: The Future Stone. There, you can find out more about the crew, planned locations, and the director’s vision. The post-production plan is to enter it into the Edinburgh International Film Festival. Until then, there’s the task of getting it shot! 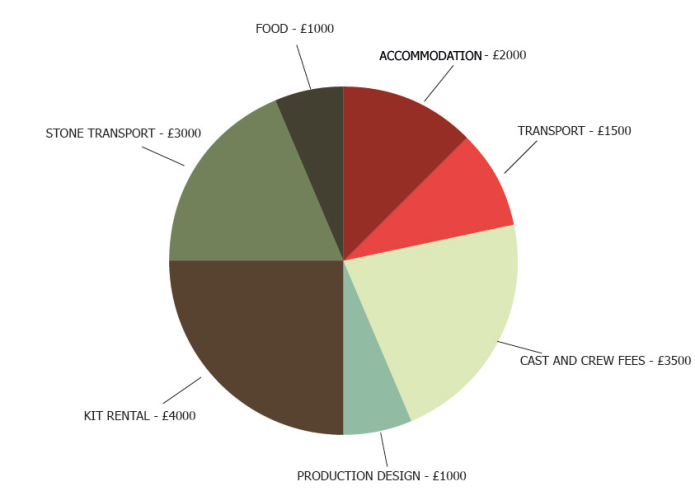 For any film students reading, you can see a breakdown of the planned funds above – handy to note, for any future shoots of your own. Best of luck to all concerned with this one! For the latest news, you can follow The Future Stone‘s production @ZeroFilmsUK. Amazing post! I love the young Cameron Lee’s passionate nature, and that he is not locked into a Hollywood mindset. The Future Stone is already the new age of film making. I am very excited about the work that the Barnes Film Festival is up to! Thank you very much, they’re filming right now. We’ll be publishing a follow up post on progress later in the year. I can’t predict the future, unfortunately, but I bet it’ll still be a good post. Reblogged this on Queen's end.